Erroll Southers was censured by the FBI for using a federal database for personal reasons. Washington (CNN) -- The Obama administration's nominee to head the Transportation Security Administration withdrew his name from consideration Wednesday. 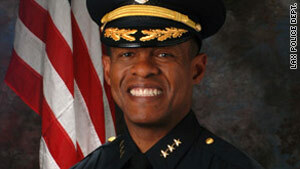 Erroll Southers, assistant chief for homeland security and intelligence at Los Angeles World Airports Police Department, was nominated for the post by President Obama in early September. He came under fire from the GOP for testimony before Congress in which Senate Republicans say he gave incomplete information about accessing a federal database for personal reasons. The move led to a censure from the FBI. Sen. Jim DeMint, R-South Carolina, also spearheaded GOP objections to Southers based on concerns over the TSA becoming unionized. Specifically, DeMint and other Republicans have expressed concern that collective bargaining -- a union tactic allowing workers to organize together and negotiate on issues such as hours and wages -- would be allowed if Southers takes over. "It is clear that my nomination has become a lightning rod for those who have chosen to push a political agenda at the risk of the safety and security of the American people," Southers said in a written statement. "This partisan climate is unacceptable, and I refuse to allow myself to remain part of their dialogue." Obama "believes that Erroll Southers would have been an excellent TSA administrator but understands his personal decision and the choice he has made," White House spokesman Nick Shapiro said Wednesday. The dispute over Southers' confirmation came as the agency is under the microscope after the failed Christmas Day terrorist attack on a Northwest Airlines plane heading to Detroit, Michigan. Gale Rossides, a holdover from the Bush administration, is serving as acting TSA director.